Wait, Donald Trump tried to do WHAT to Hillary Clinton and James Comey? Donald Trump spent his entire campaign publicly promising to imprison Hillary Clinton on false charges if he won. Then, after Donald Trump learned that FBI Director James Comey was investigating Trump’s very real crimes, Trump fired Comey and began threatening to imprison him on false charges. Now we’re learning that Trump really did try to put Hillary and Comey in prison earlier this year. 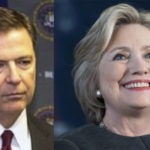 Donald Trump sought the criminal prosecution of Hillary Clinton and James Comey back in April of this year, and it’s just now becoming public, thanks to the New York Times. As the story goes, Trump’s effort was stymied by then-White House Counsel Don McGahn, who warned him that these phony prosecutions could lead to Trump’s own impeachment and ouster. It’s worth pointing out that every time one of these stories about Donald Trump’s overreach has surfaced over the past year, Don McGahn is always conveniently portrayed as the hero. This strongly suggests that McGahn is the source for these stories, and that he’s been putting them out there in order to distance himself from Trump’s crime spree. But despite the obvious bias involved here, there is no reason to believe that McGahn is making this up; it very much appears that Trump really did seek to put Hillary and Comey on trial for crimes they very clearly did not commit. It’s notable that McGahn – if he is indeed the source on this – is choosing to leak it to the public right now, just as Special Counsel Robert Mueller is preparing to make his big moves against Donald Trump. This paints Trump as a criminally and psychotically out of control would-be dictator who truly did try to imprison Hillary simply for being his political opponent, and imprison Comey simply for doing his job as a law enforcement official. McGahn is right: this is impeachable. It’s also grounds for Trump to be imprisoned after he’s ousted.